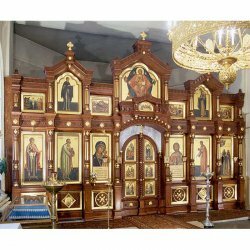 The main specialization of the Workshop is manufacturing of wooden carved iconostases for all types of Christian cathedrals, churches, chapels, houses of worship around the world. 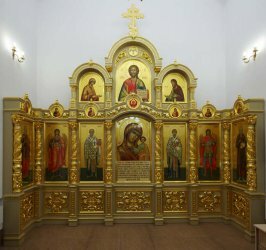 Considering all your wishes, our skilled experts, such as artists, designers, engineers and carpenters, will offer you projects of iconostases in compliance with Christian canons, rules and traditions; they will skillfully and harmoniously coordinate the project with the architectural features of the temple, develop sketches and working drawings of the iconostasis, which will meet your needs. 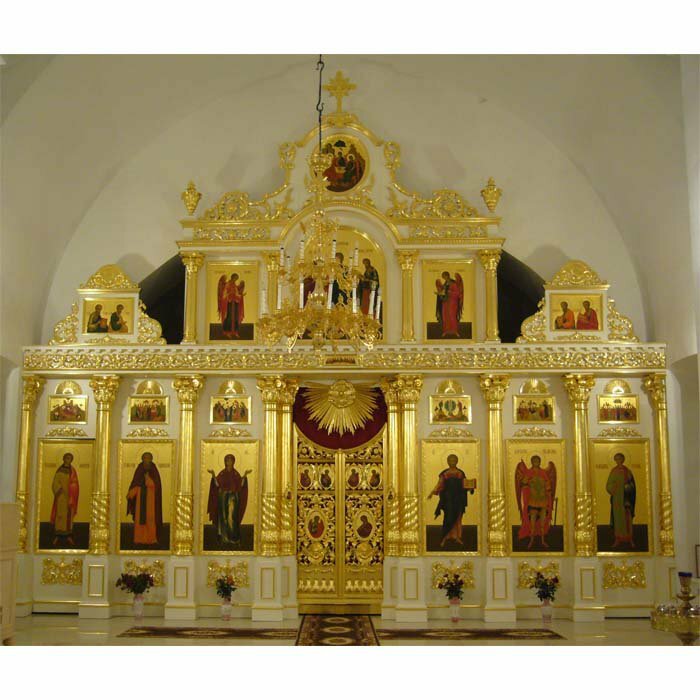 It is also possible to create an iconostasis according to a ready project provided by a customer, and even produce one that is based on a photo of an iconostasis that you like. 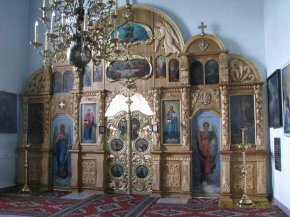 A distinctive feature of our workshop is that we produce carefully thought out collapsible designs of iconostases, i.e. 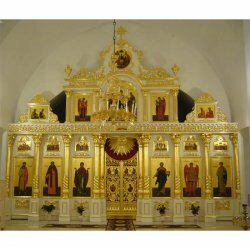 an iconostasis is made in such a way so that all the work on its assembling can be done by non-professionals in any country with the help of the provided drawing and assembly manual. 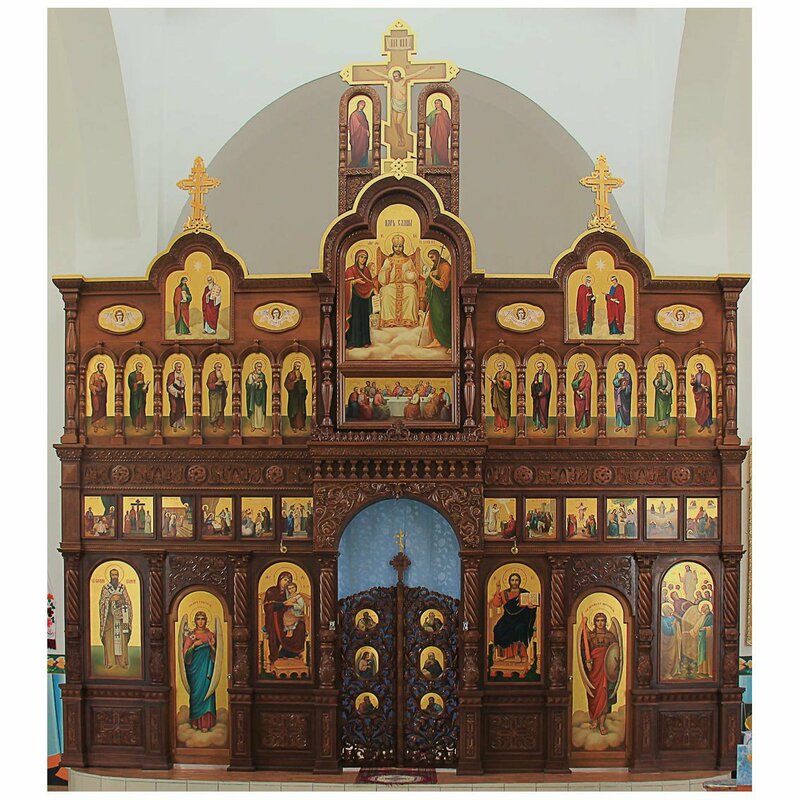 Thus, assembling an iconostasis created in our workshop is as easy as easy as assembling a children’s erector set. 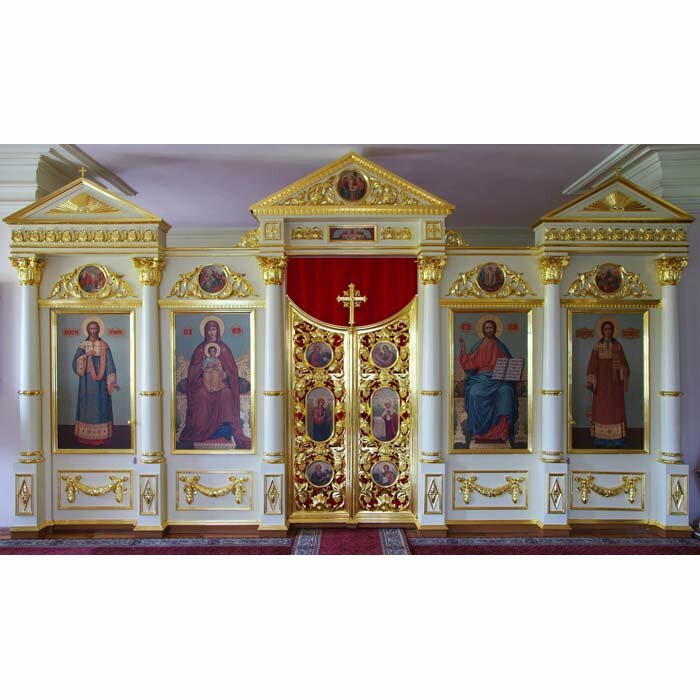 To manufacture iconostases only selected precious kinds of wood are used, such as oak, linden, alder, ash, pine, that are harvested in ecologically clean mountainous regions of Ukraine. 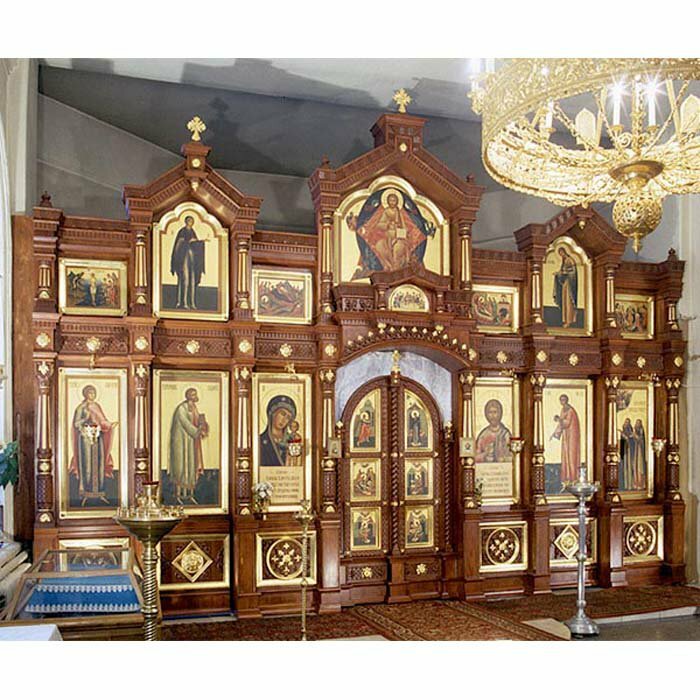 This wood goes through primary processing, undergoes radiological control, and then it is aged in special drying rooms for at least 5 years.These procedures provide 100% guarantee compliance with moisture norms and other parameters of the quality of materials. 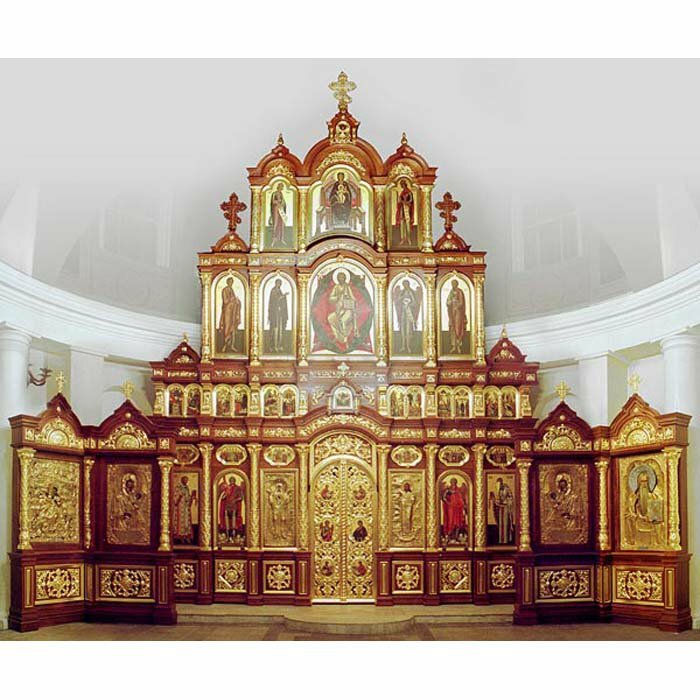 In our work we do not use any kinds of plastics, foams, polyethylene, and other synthetic materials. The icons in our iconostases are hand-painted with natural dyes, the wood is select, and the gold is real! 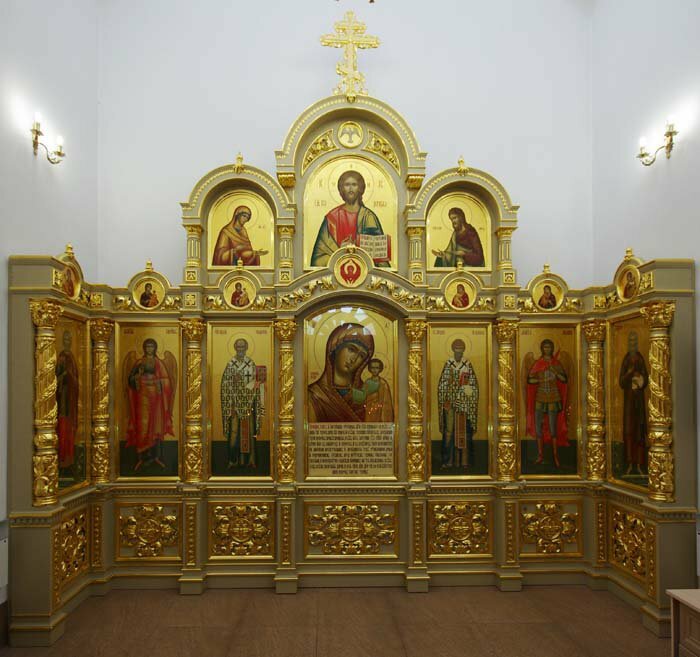 All the work on production of the iconostases, from designing sketches, joinery, manufacturing of icons to painting and packing is carried out directly in the workshop, which allows us to fully control all the stages of production. 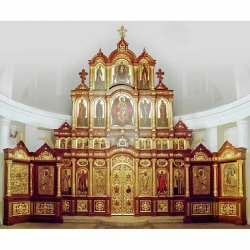 Logistics, delivery, customs clearance, creating accompanying documents, expert consulting are carried out by our technicians. 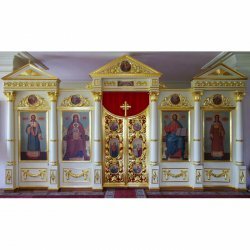 Below you can see the photos of the iconostases produced in the workshop, choose the one that you like, and order its manufacturing.All the iconostasis prices are approximate, given per square meter, and are calculated individually based on complexity of the work, materials used, etc. 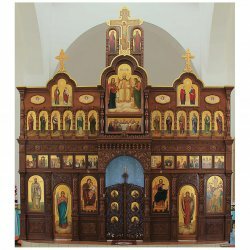 To order a unique design of an iconostasis or to submit your drawings or photos, contact the managers of the workshop here.